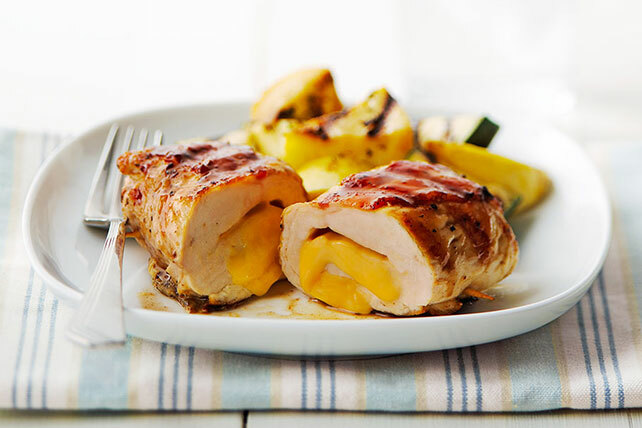 Add some zest to your dinnertime with our Grilled Chicken Roller recipe. Our delicious chicken rollers feature bacon, cheese and KRAFT Balsamic Vinaigrette Dressing. Pound chicken to 1/4-inch thickness. Place, smooth sides down, on work surface. Top with Singles; roll up tightly. Wrap bacon lengthwise around each roll-up, stretching if necessary to cover exposed Singles; secure with wooden toothpicks. Grill 15 to 20 min. or until chicken is done (165ºF), turning frequently and brushing with dressing for the last 5 min. Remove and discard toothpicks before serving. Substitute 1/2 cup KRAFT Shredded Cheddar Cheese for the Singles.